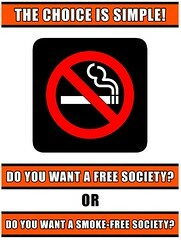 If you don’t think smokers are a persecuted class, then you haven’t been paying attention. Those who choose to smoke face a new smoking ban or exorbitant tax nearly every day, under the guise of “public health” – a rarely defined and limitless justification for restricting the choices that individuals are permitted to make about their own lives. The proposals, which have been drawn up by Leicester City West Primary Care Trust, could be extended to other areas. The Leicester plans would involve smokers being given counselling and nicotine patches to help them stop. But the patients would have to give a blood sample to prove they had quit before being put on the waiting list and admitted for elective non-emergency surgery. Doctors would decide whether to operate if the patient failed to give up. The Leicester trust will launch a consultation on the proposals to coincide with the smoking ban that comes into force in England on July 1. Now keep in mind that Britain has nationalized health care, and that the denial of care is by government doctors who are paid with taxpayer funds – particularly the billions collected in tobacco taxes. In Great Britain taxes have driven the cost of a pack of cigarettes up to £5.50, or nearly $11 U.S.
And if turning smokers into pariahs is the goal, then Britain is doing a good job. The government recently announced that smokers would be liable for an £80 on-the-spot fine for stubbing out cigarettes in the street. And European Union officials are considering banning smokers from lighting up outside office doorways, at bus shelters, and on outdoor train platforms. The British ought to spend a little more time providing dental care and a little less time discriminating against smokers.